Plácido Domingo: singer, conductor and administrator. He has sung 140 different roles, more than any other tenor in the annals of music, with more than 3600 career performances. His more than 100 recordings of complete operas, compilations of arias and duets, and crossover discs have earned him 12 Grammy Awards, including three Latin Grammys, and he has made more than 50 music videos and won two Emmy Awards. In addition to three feature opera films—Carmen, La Traviata and Otello—he voiced the role of Monte in Beverly Hills Chihuahua, played himself on The Simpsons, and his telecast of Tosca from the authentic settings in Rome was seen by more than one billion people in 117 countries. He has conducted more than 450 opera performances and symphonic concerts with the Metropolitan Opera, Covent Garden, Vienna Staatsoper, LA Opera, Chicago Symphony, Vienna Philharmonic, Montréal Symphony, National Symphony, London Symphony, Los Angeles Philharmonic and Berlin Philharmonic. In 1993, he founded the international voice competition Operalia. In recent seasons, he has celebrated his 40th anniversaries at the Met, Vienna State Opera, La Scala, Arena dei Verona and Covent Garden. For LA Opera, where he is the Eli and Edythe Broad General Director, he created the role of Pablo Neruda in the 2010 world premiere of Daniel Catán’s Il Postino. Although he has no intention of moving substantially into the baritone repertoire, in 2009 he added the title role of Simon Boccanegra to his repertoire, with subsequent performances at the Met, La Scala, Covent Garden and in Madrid, Berlin and Los Angeles. 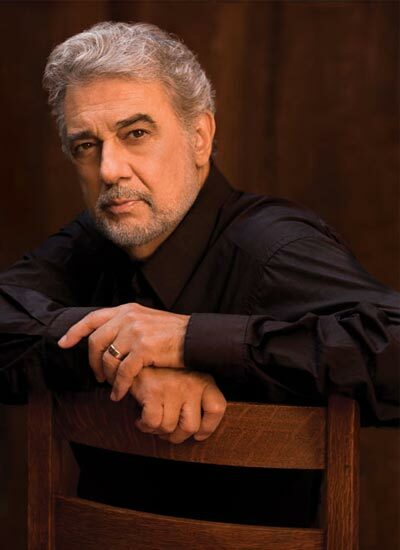 In the 2012/13 season, he will add two new baritone roles to his repertoire, Francesco Foscari in I Due Foscari in Los Angeles, and Germont in La Traviata during his 45th season at the Metropolitan Opera. To view the complete calendar of events, click here.